It takes a long time time to sand the paddles properly. After the final shaping, then there is the sanding with 100 grit, then 220 grit, then detail sanding by hand. Here is the first group of paddles sanded and with the logo applied. Ready for the first coat of varnish. Two coats of varnish, two more to go. 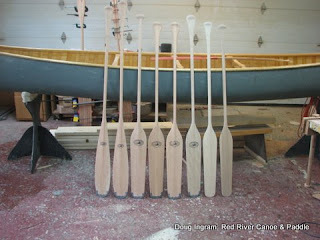 There are also two historic model Voyageur paddlesin this batch, they get the blades painted red. 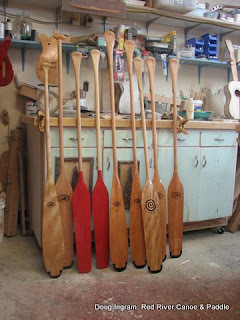 The voyageur brigades had paddles decoratively painted in "team" colours. Posted by Doug Ingram at 2:21 p.m.